When it comes to food, there are times when the call of the buffet, with its all-you-can-eat prawns and multiple choice desserts, is simply too great. For an Australian sports fan, this is the appeal of the Commonwealth Games. Where the Olympics serves up precious morsels of victory, the Commonwealth Games is a veritable smorgasbord for athletes with an Aussie passport. Sure, the decor may not be as classy. 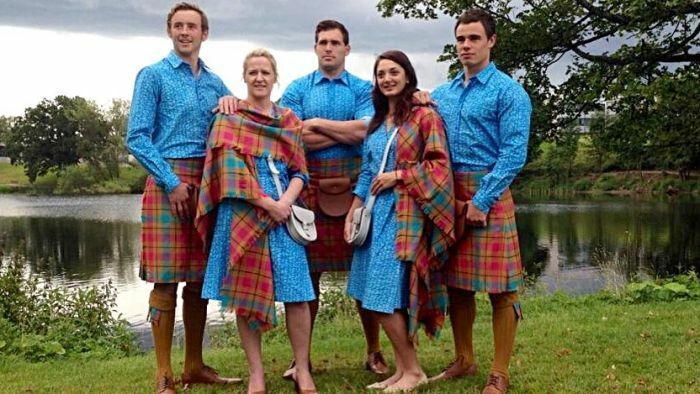 One look at Scotland’s uniforms will tell you that. Or our own, for that matter. And it may not get the same reviews as more classy establishments. But in this particular restaurant, we’re the biggest customer. We get the best seat in the house, we eat well and we can keep going back for more. 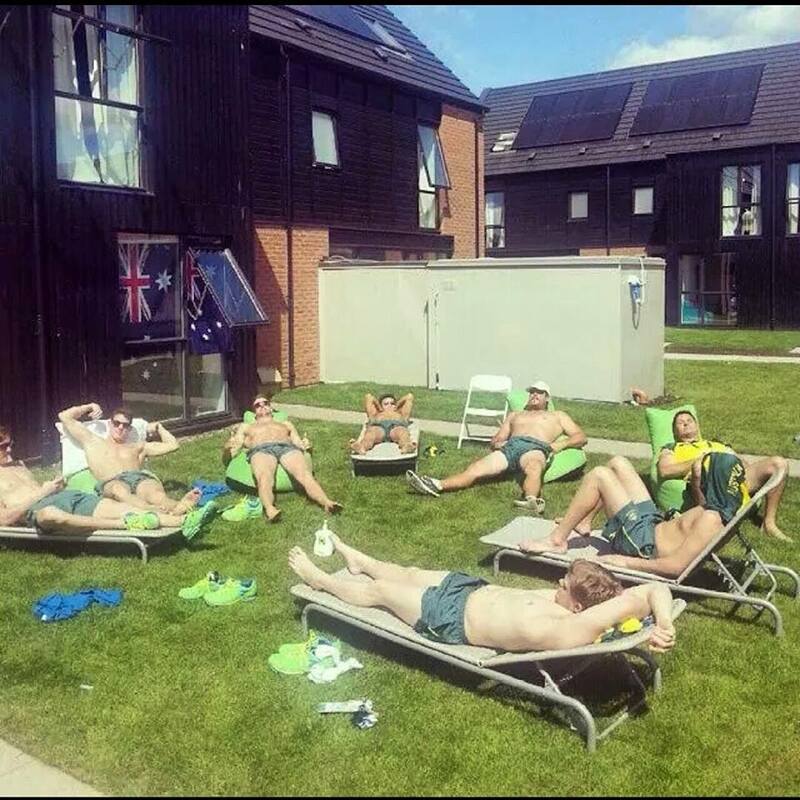 Eventually we leave, bloated and content, like these happy campers in the athletes’ village (with thanks to James Magnussen for the pic). And what the Commonwealth Games lacks in status, it makes up for with its family friendly atmosphere. There is not the angst and pressure that comes with the three-hatted Olympics. If the Missile fails to fire in Glasgow, it won’t be anywhere near as bruising as it was in London. Not that there’s any chance of that. Not in this pool. It’s also a cheese lovers’ paradise. On what other international stage would you see a ballet performed to The Proclaimers’ 500 Miles? Now there are those who say this eatery should be shut down, that with its quaint outdated foundations in the British Empire it has lost its relevance and no longer attracts the celebrity set. But the Commonwealth Games is entirely relevant, particularly as a forum for Aussies to beat Poms. It is an expression of that most celebrated of rivalries between our two countries. And that is a tradition most definitely worth preserving. England competes as England at the Commonwealth Games, not as four nations brought together under the banner of Great Britain in some medal-enhancing trickery as it does for the Olympics. And we routinely trounce them. Australia has topped the medal tally in 12 out of 19 Commonwealth Games, including the last six. 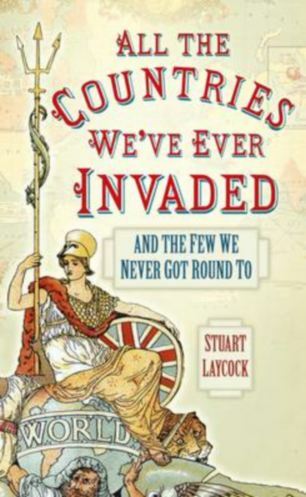 England has inexplicably taken the spoils six times. In Delhi, we came away with 178 medals, 74 of them gold (see what I mean about the smorgasbord? ), streets ahead of England’s 142 medals, of which just 37 were gold. Of course, there is a small concern that England may draw some kind of home soil advantage in Glasgow, even with the Scots about to vote in a referendum on moving out of their United Kingdom home and getting a bachelor pad. 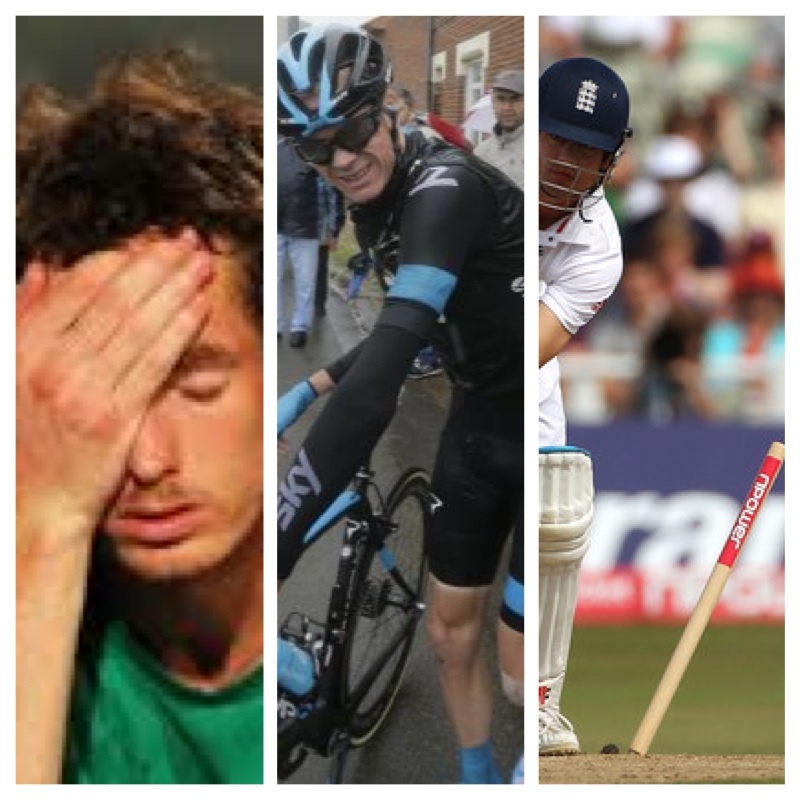 But recent sporting events have conspired nicely against them, Andy Murray bundled out of Wimbledon in the quarter finals, Chris Froome and Mark Cavendish crashing out of the Tour de France and English cricket in total despair after a Test loss to India and the Ashes debacle still fresh in their minds. So Team England comes to the Commonwealth Games with its confidence shot and and a mindset for defeat. A dish we in Australia will be more than happy to serve them. Down Under, we’ve got the napkins tucked into our shirts and our knives and forks at the ready. Australia, your dinner is served. Next Post Are you trying to kill me, sport? Thanks Mum! That’s classic. Your granddaughter was getting right into Rod Stewart as well. She thought he was cool. It was a fun opening ceremony.